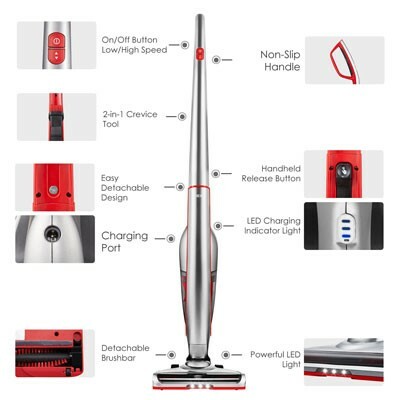 Home » Best Deik Vacuum Reviews – Worthy Investment For 2019? If you were looking for very cheap yet well-qualified vacuum cleaners, heard that deik vacuum company manufactures something like this and end up being here, you are in the right place and yes you heard that right. 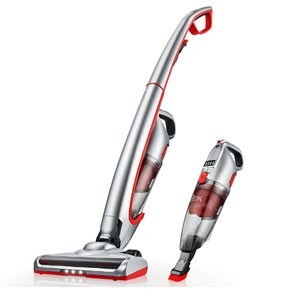 You want cheap and perfect vacuum cleaners, deik ones are the one you should be looking for. You will be gone through some promising deik vacuum cleaners next. 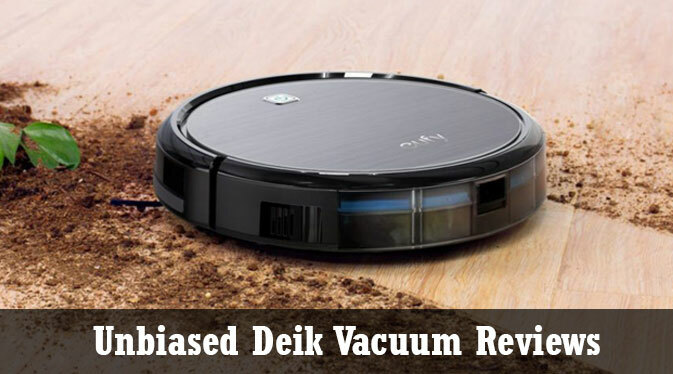 In these deik vacuum cleaner reviews, you will be able to know why. Well, cheap vacuum cleaners are not that rare to find. They are everywhere. You will find a lot of them in different places. Then what is it that makes deik vacuums exceptional? The thing is big price do bring big conveniences and quality fragrances. Whenever manufacturer companies try to cut the price, they cut quality along with it. The parts might be offshore, poor suction, cumbersome usage – you name it, it will be there. Unlikely, Deik vacuum cleaners happened to be found otherwise. 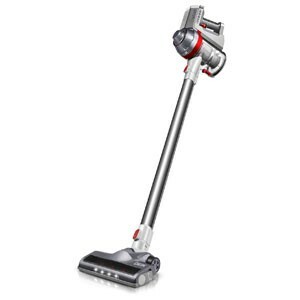 They are sturdy, possess great longevity, great suction power comparing the top-notch cordless vacuum cleaners. Oh, I forgot, these are cordless vacuum cleaners. Deik has only some cordless and robot vacuum cleaner in its line-up. Additionally, these vacuum cleaners conveniently weigh very low. These are some of the very lightweight vacuum cleaners available now. There are five Deik cordless vacuum cleaners and a robot vacuum cleaner available on Amazon.com. Let’s start with the most popular one among them, the Deik ZB1516. The Deik ZB1516 is one of the primary deik vacuum cleaners and it was a market owner. The vacuum wand can be detached very easily here turning the vacuum into a handheld one. That’s why deik calls this a 2 in 1 vacuum cleaner. Anyway, this is a pretty available feature nowadays. The main goal of manufacturing the Deik ZB1516 was adjoining lightweight convenience with stronger suction power, while still confining the price within the cheap range. Did they succeed? Of course, they did. Check it out below. Basic attributes: We’ll talk about some basic attributes of the Deik ZB1516 like maneuverability, weight, suction power, runtime etc. Dual settings are available for both type of surface, hardwood and carpet. The settings can be easily switched between them by accessing an easily accessible switch. Speaking of this dual settings, hardwood mode simply just turn the brushroll off. The brushroll is stiff, ensuring additional efficiency while picking up hairs. In this article, it is the lightest vacuum cleaner. It weighs only 4.7 lbs. Wondering how might the suction power be in this light vacuum cleaner? You will be amazed. This vacuum cleaner generates 7Kpa suction power while maneuvering. Which is massive counting the weight it possesses. 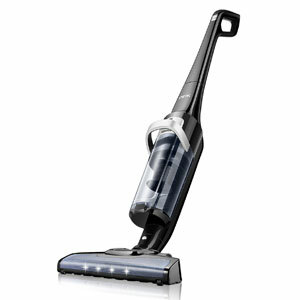 Among contemporary cordless vacuum cleaners, the Dyson V6 has the most suction power and that is 11kPa. Forget not, the Dyson V6 weighs more than 5 pounds. This is a very good performance by the Deik ZB1516. The Deik ZB1516 is backed by 22-volt battery. The Deik ZB1516 runs for about 25 minutes with a single full charge. Dust cup capacity is an important vacuum cleaner attribute that we often overlook sometimes. If the dust cup is too small, there is no point of having a flagship vacuum cleaner because you have to empty the dust cup too frequently. If you have a small house then it is a different story though. Anyway, The Deik ZB1516 comes with a 17 ounces holding capable dust cup. Taking the lightweight into the account, the dust cup capacity is very impressive. It is another important thing to look for in a vacuum cleaner if your house has a lot of deep dark corners. These lights will aid you to find tiny pieces of dust then. Deik tried to keep the procedure of emptying the dust cup as simple as possible. Anyway, hard luck, it is not as efficient as those Dyson cordless vacuums perform. If things get real messy, you will have to dirty your hands. HEPA filters! Great choice if you are allergic to allergens. There is a button reside just beside the trigger button that continuously keeps the motor on. No need to keep on pressing a button if you want to conduct a long vacuuming session. The brush attachment tool that comes with it, is a combo attachment combined with a soft rubber edges attachment tool. The rubber edges attachment can be unhid by a simple press of a button (refer to the picture). This feature is rare. The Deik (MT1206) is depicted above. You can call it a rebranding of the Deik ZB1516. Both of this are totally identical while the MT1206 is more stable. Anyway, if you want the old Deik ZB1516, click here. The best Deik vacuum cleaner has already been reviewed above. According to the consumers’ acceptance, that one is vastly popular. Anyway, Deik authority didn’t just sit idle after it being famous. They tried to tweak different things to ease different type of consumers’ demand. In the continuation of this process, this vacuum cleaner was manufactured. Before jumping into the in-depth review, let’s see what changes have been brought here from the previous deik and why. Deik tried to make the vacuum cleaner run about ten minutes more compromising the suction power a tad amount. For the Deik ZB1516, some customers still complained about a bit of wrist pain while cleaning upholstery. It is already a very lightweight vacuum cleaner, then where is the problem, why is it causing the wrist pain? The answer is the main weight carrying portion is adjacent to the wrist which brings wrist irritation, I have heard this complaint also from some Dyson v series users. 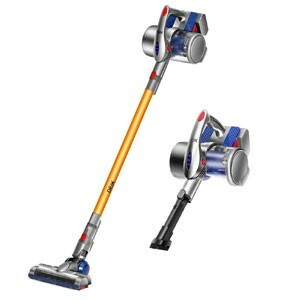 Here’s mentionable that the Dyson V series’ cordless vacuum cleaners are almost identically designed. This vacuum cleaner weighs little amount more than the previous. That is why, to prevent the wrist irritation; the most weight carrying machine and dust cup – the handheld portion is placed in the middle. Deik gives a thorough look upon its look. It is visually beautiful. If you want your vacuum cleaner as a nice home décor too, this is the one for you. Basic Attributes: Let’s check the basic attributes it shares. Swivel steering is also available here. I think this is a must while going for a vacuum cleaner. The ability to lead the floor nozzle acutely with just spinning the wrist is a great convenience which swivel steering offers. Two-speed settings available for Hardwood and carpeted floor. This vacuum cleaner weighs 6.7 lbs. You can detach the canister portion and turn it into a compact handheld vacuum cleaner. The handheld portion weighs 5.1 lbs. The suction power of this vacuum cleaner is yet to be measured. By using the Deik ZB1516 and this vacuum cleaner side by side, I found out that this can generate lesser suction than the previous deik. This is backed by an 18-volt 2200 mAh battery. The battery will take about 4-5 hours to be fully recharged. The main appealing portion of this vacuum cleaner has arrived. This will run for about 35 minutes continuously after a single full charge. If you own a big house, this is what you should go for. The dust cup here is small. Only 13.5 ounces. Well, there is a reason for this though. 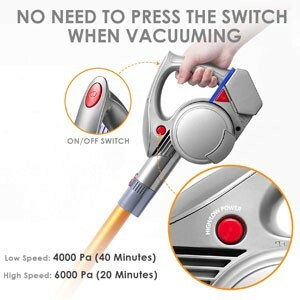 You can detach the canister here and turn it into a handheld vacuum cleaner but this doesn’t do any good like those Shark Lift-Away vacuum cleaners because the canister will be fully detached without any connection with the vacuum wand. For this, you cannot have the privilege of cleaning under the furniture with ease just by sneaking the vacuum wand under a piece of furniture. 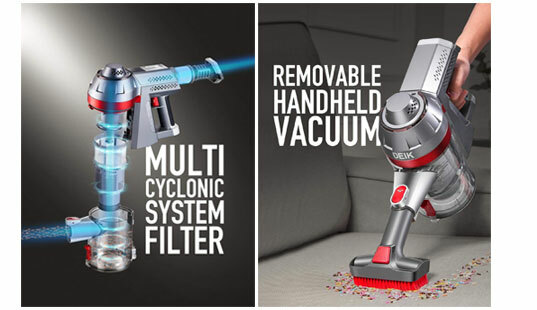 If you want to clean under the furniture, you will have to keep the handheld vacuum attached. The dust cup is placed here. If the dust cup were bigger, you won’t be able to put the whole vacuum cleaner under furniture. Anyway, this doesn’t necessitate the need for a bigger dust cup. If you want a bigger dust cup then I’d suggest you look for something else. There are LED lights on the floor nozzle to light the cleaning path. Like before, no special mechanism is applied while clearing the dust cup. Loose dirt can be shook off, but if things get real messy, you will have to touch this mess with your own hand. Hepa filters are used for filtration. The optional trigger lock button is also available here. No need to keep pressing the button always. Another 2 in 1 Deik vacuum cleaner arrives. This is designed almost identically as the previous one. But the cons have been fixed here. Deik has brought back the same old 7kpa suction power here, same powerful battery; and the dust cup is designed such that the capacity is increased as the Deik ZB1516 but this will not get in the way while vacuuming under furniture. More details coming up ahead. Like before, dual settings available too for both carpeted and bare floor. 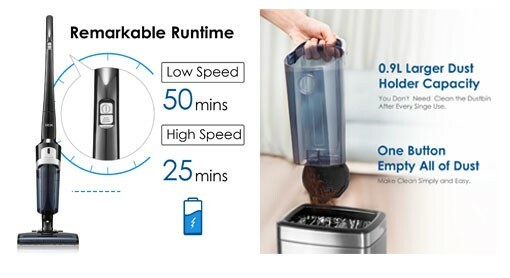 Here’s mentionable that this vacuum cleaner is specially designed to tweak battery life or runtime. The bare floor setting is designed to consume less power than it will consume on high power mode. This allows the vacuum cleaner to run extensively while running on low power mode. It weighs only 5 lbs. Weight is reduced than the previous one while still having a bigger dust cup and better motor. Plus one. As said, the same old 7 kPa suction power is brought back here. 22.2 V Li-ion battery is used here. 35 minutes on Low power mode. 17 ounces of dust cup is also brought back. LED lights are placed at the floor nozzle. Nothing special. The same old system to empty the dust cup. You will have to use your hands if needed. Here, Deik has taken a close look upon the filter and made it more efficient. It is a multiple filtering systems with multi-stage cyclone device core. It puts on a 3-layer filtration system. For the first time, you will get an electric brush attachment. This vacuum cleaner is very silent. The noise is measured only 70 db. Ever heard of shark multi-flex technology. Well, if not the multiflex allows the vacuum cleaner to be resilient at the middle. What good it does? It allows the vacuum cleaner to be placed under furniture without bending your back, and it allows the vacuum cleaner to stand still all by itself.Here, that option is available. You cannot conveniently put it under the furniture like those shark do though, but you can keep the vacuum cleaner standing alone. This vacuum cleaner is all about stamina. The previous vacuum cleaners were all about being lightweight and sleek structured. But Deik goes big here. It has a very big XL sized dust cup, like really big. 30.5 ounces, can you imagine it? A cordless vacuum cleaner holding such big dust cup, this is rare. This is backed by a very resourceful battery which ensures up to 50 minutes of runtime. And all this is available within a machine that weighs not more than 8 lbs. Out of excitement, I have already revealed this vacuum cleaner’s key features up above. Let’s get into these more detailed. Swivel steering enabled floor nozzle. There are two settings available. High power mode and ECO mode. 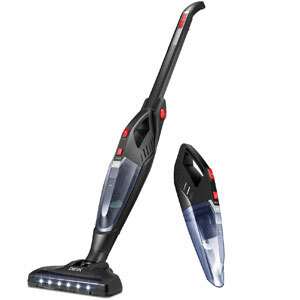 Eco mode ensures the capability of long vacuuming session up to 50 minutes. It weighs only 8 lbs. Impressive. Because it is a big vacuum cleaner with high powered battery, motor and big dust cup. It is backed by a 28.8V Li-ion battery. This is the place where this vacuum cleaner shines. 25 minutes – on high power mode. 50 minutes – on ECO mode. Another shinning place, a very big 30.5 ounces/.9 liter dust cup is featured. Like before, no specialty here. Open the hatch, let the dirt fall by itself. Use your hands if some remain stuck. Wall mounting option available for less space occupying storage. However, an important thing to look out. This is a full-sized upright vacuum. It has the benefits that upright vacuums have. But it has its demerits. You cannot just put this bulky vacuum cleaner anywhere. And you will suffer cleaning under furniture, below which there is less space. In this portion of this Deik vacuum reviews, I will be talking about the least impressive vacuum cleaner in this list. It lacks every segment than the previous ones. Less suction power, relatively heavy weight. The only good thing is its runtime, some premium attachments that come with it and a hardwood specialist floor nozzle. The thing is Deik wanted to produce a Dyson look-alike cordless vacuum cleaner and this is it. While trying to maintain the structure, these attributes was given up. Let’s go through some basics to determine what good it brings. Swivel steering enabled floor nozzle, easy to maneuver. Two settings are available for the bare and carpeted floors. Bare floor setting allows the vacuum cleaner to run 40 minutes. This vacuum cleaner weighs 5.5 lbs. Which is heavier than Deik ZB1516 and Deik BS001. The suction power is measured at 6 kPa which is lower than the Deik ZB1516. It is backed by a 21.6V battery. Emptying the dust cup is easier than the previous ones though. You already know by now that this vacuum cleaner is technically behind than previously described Deik vacuum cleaners. Does it do anything worthy for which it can be purchased at least? Well, some different feature is available though. Check out if these match your any specific needs. In numbers, it lacks than the others but it performs not so bad. It does what it is meant to be and it delivers it good. It looks totally like a Dyson v series vacuum cleaner, aesthetic. And it costs 1/5 of what an actual Dyson v series vacuum cleaner does. Some premium attachments like metal tube come with it. The Deik cordless vacuum reviews have come to an end. Now let’s see what Deik robotic vacuuming choice is available out there. Deik is all about delivering the best within a very cheap price. Currently. iRobot robotic vacuum cleaners from Roomba are trembling the market. 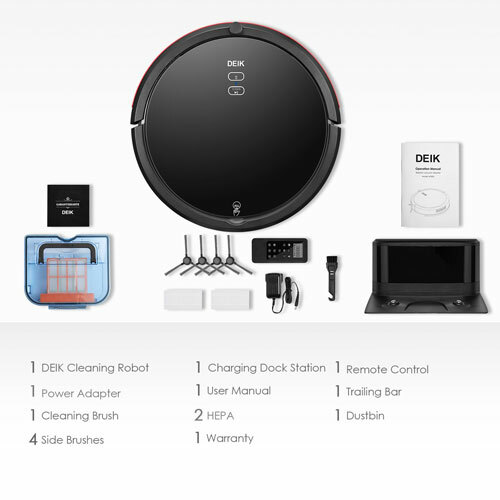 The reason I put up the name of iRobot is, this Deik Robotic vacuum cleaner priced under even the most basic entry-level robotic vacuum cleaner of the iRobot line-up. Let’s see what good this cheap robot vacuum cleaner does. Talking about the most important features that can be found on high-end robot vacuum cleaner first. A robot vacuum cleaner must have to be smart, and in this context – smartness means prevention from falling, colliding etc. And of course, self-charging capability while the battery is almost depleted. All these smartness is available in a Deik Robot Vacuum Cleaner. It conducts a 3-stage cleaning while performing. There are large wheels aided with a rolling brush and 2 side brushes. The wheel helps the robot to climb thresholds while the rolling brush does the cleaning mainly. The two side brush collects and sends dirt from edges to be sucked. Edge mode to clean edges where dirt is hard to reach. Time scheduling and auto recharge system available. You do not have to do anything manually. Just set these at first and you are good to go. Your Deik robot vacuum cleaner will do all sort of cleaning by itself according to your preset time. It weighs 6 lbs. This robot vacuum cleaner will carry itself around. No need to be worried about its weight, haha. The suction is measured at 1.2 kPa. For a robot vacuum cleaner, this suction power is good. This is important. 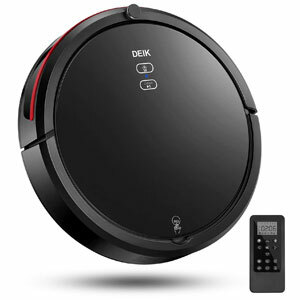 A Deik Robot Vacuum Cleaner will fully charge itself consuming 4.5 hours. That is not slow. A massive .9 liter/30.5 ounces dust cup is inserted into a Diek Robot Vacuum Cleaner. Another very important aspect is different parts of this robot cleaner is very much available. If any single part fails, you have a backup. You can always purchase that specific parts paying a very reasonable price.